Includes a one page article on the upcoming JLA/AVENGERS mini-series, plus quotes from George Perez. This issue of the world's longest-running magazine about comics includes the following: a piece on JLA/Avengers; Catching Up with Ted Halsted; a feature on races between Superman and Flash; a feature on Dark Horse's Universal Monsters comics; plus the usual reviews, news items, and more. When is the long-awaited crossover between The Avengers and The Justice League of America? 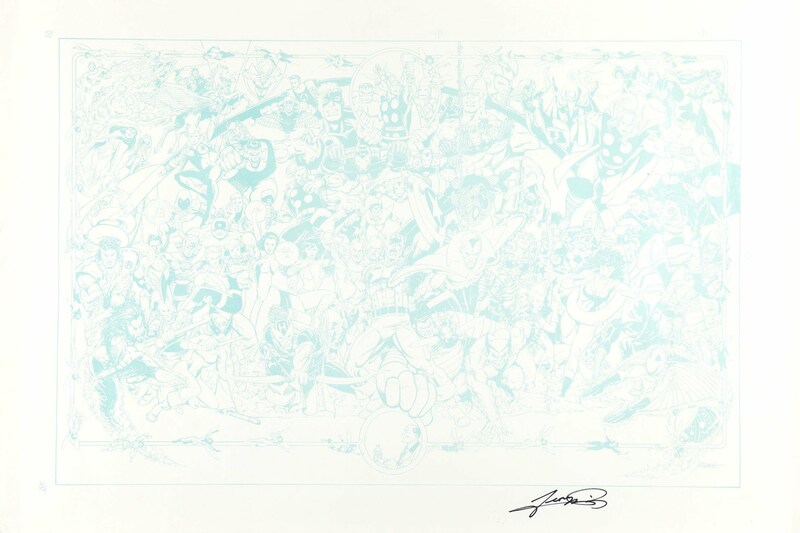 "At home right now," quipped artist George Pérez, who added that he has penciled 85 of JLA/Avengers' 150 total pages counting covers, and had inked 33 pages as of his appearance at the Pittsburgh Comicon in late April. "I'm now going at a rate of about a page a day, and I hope to have all the penciling done by September so that, by the time I'm working at CrossGen, all that's left is the inking for the rest of the book," he said. Even so, Pérez said he does not expect the first installment of the four-issue mini-series to be released for a year. "What is ironic is that my first issue of my monthly CrossGen title may actually come out first, though I won't be starting it until October, just because we want to make sure I am well into the inking stages of the fourth issue before we schedule it," he said, "so the book will come out monthly." Pérez is on a leave of absence from CrossGen to work on the project. Two individuals who have seen the pages said they are confident fans will approve of the final product, which is being written by Avengers writer Kurt Busiek. "What I've seen so far is classic Pérez to the 10th degree," said Marvel Editor in Chief Joe Quesada. "You can tell that this is the project that George has been waiting to draw his entire life - actually, that he was born to draw. It's just spectacular, absolutely spectacular, because when you think he can't fit any more into the panel he fits some more." "I've done about 15 pages so far, and they're amazing. It's George at his best," said Tom Smith, colorist on the project. Smith said he can do about a page a day on JLA/Avengers -- he does about two r three pages a day normally. "But with JLA/Avengers it's a very time-consuming process," he explained, "but it's worth every second of it, because George is putting his best foot forward on this book and pulling out all the stops. Every fan who has been waiting for this project for 20 years is going to love every second of it." Known for his work on team comics and multi-character crossovers, including extended runs on Marvel's Avengers as well as a stint in the '80s on Justice League of America, Pérez is the only member of the creative team remaining from Marvel and DC's attempt 20 years ago to collaborate on a project uniting the companies' super-teams. Inter-company politics scuttled the earlier project. "It was such a fanboy dream for everyone and such a monumental example of bureaucracy at its worst when it was lost for whatever the reason, that it being resurrected - actually being completed - is almost indicative of the industry itself," Pérez said. "Of how it seems to be rehealing itself from a lot of mistakes thanks to decisions being made at Marvel, at DC, companies like CrossGen, and others that are just revitalizing the industry. "I think it's kind of showing that the love of doing comics for the sake of doing comics is becoming just as important as the profit margin. It looks like a lot of healing has gone on. And for me it's the chance to get one last crack at the major characters, because, once I'm working at CrossGen full time after JLA/Avengers, I won't be seeing or drawing the big superheroes of Marvel and DC. I want it to be a really good valedictory address." Pérez acknowledged that expectations are high for the project, which will be released as four 48-page books with wraparound covers, but said he is having a great time working on it and is challenging himself where he can. "Whenever there's a simple approach to a page, I usually try to avoid that and make it as dynamic as possible," he said. "The exhausting thing about this project is the fact that now with the larger page count that this project has - since the original was 64 pages total-everything and the kitchen sink is being thrown in on this book, and I try to draw every little crack and drop on that sink." Pérez said that, thanks to a "clever script" from Busiek, he has gotten to include several visual puns - for instance, a shot of Marvel's Watcher standing next to the JLA Watchtower. "I just love that idea - what a great visual pun," Pérez said. "Kurt's got a lot of that in there. It's definitely a fanboy writing this, with the knowledge and expertise." However, Pérez said he admires his writer - with whom he relaunched the current Avengers title - for more than just sight gags. "I think one of the differences, other than the uniqueness of it in the '80s, is that, while I believe the original writer treated it as an assignment, Kurt is treating it as history being fulfilled, a destiny being fulfilled," he said. "He realizes the weight of the project and is doing some of the best work he can do - again, with the compromises that are necessary when you're working with two separate companies and two separate approaches to everything from writing to drawing to coloring. They all have their different approaches - you always have to find that middle ground." Pérez said he has been enjoying the opportunity to work on the various JLA members, including Batman ("a great visual character") and Wonder Woman, whose series he relaunched back in 1986. "I just came off Avengers. I haven't been away from them," he observed. "Drawing the members of the Justice League has been very gratifying, because it really has been a long time since I did so, and so many of them have gone through changes, I still have to get used to Kyle Rayner as Green Lantern - I'm still determined to draw Hal Jordan but obviously that's not the case. And the Flash - remembering that underneath that costume it's Wally West and not Barry Allen."